Are there any holes on the back for mounting on a wall or under a desk? BEST ANSWER: Yes...there are four holes on the back of the unit that would allow for mounting. Overall, a great buy. I liked the outlets on the four corners that have extra spacing to allow power adapters to fit. I also like the length of the cord and that they have a wide base which allows them to lay flat. Yes-- there are 4 special mounting holes, one in each corner on the back of this unit. The smaller units have just 2 holes on the back, 1 on each end. Yes it does, there are four of your typical slot style mounting holes, one at each corner. Yes there are four mounting holes on the back side of the unit. One in each corner. Yes. There are 4 keyhole mounting holes. There is a sticker on the bottom that says "UL listed". The plug also has a molded-in UL marker on it. I did not by this item. Yes it is UL listed! Does monoprice insure the equipment plugged in to this like other companies such as APC do with their surge protectors? BEST ANSWER: Thank you for your question. With regards to equipment warranty connected to the surge protector these are not insured. That is a good question and should be directed to the company. I am interested in the answer as well. 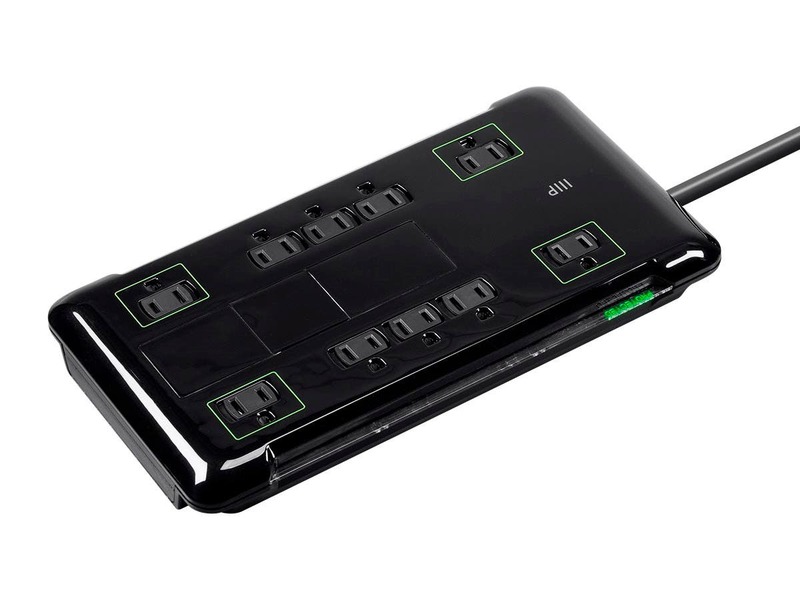 Does the green rectangle around each of the four corner outlets imply only those four are protected (as with the green "Protected" illumination) or just that they have more surrounding space for larger ac adapters to be plugged in? 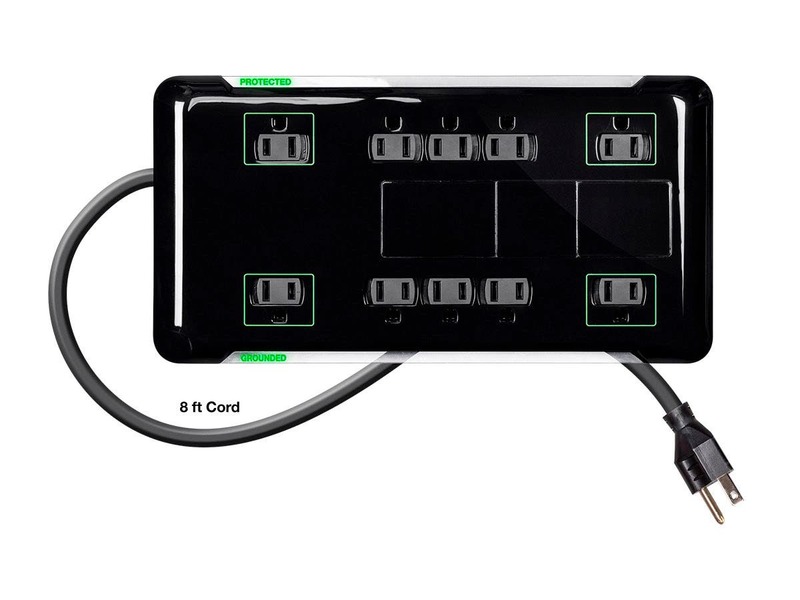 BEST ANSWER: The green rectangles simply display the fact that larger a.c. adapters will easily fit there. All outlets are surge protected, and share the 3420 Joules "total" rating. All outlets are protected. The outside corners outlets are, as you stated, for larger AC adapters. Does this have EMI/RFI Filtration? BEST ANSWER: I have used other surge protectors in this series and they do have EMI Filtration. Does this have EMI/RFI Filtration? If yes, what's the specs for the EMI/RFI Filtration? BEST ANSWER: Hi, this product does have 58dB of EMI/RFI filtration. Thanks for checking. Nice surge protector, lots of well spaced outlets with a high level of protection at 3420 Joules. Appears to do what other similar products do, but at a very reasonable price. UPDATED OLD POWER STRIP. PERFECT LENGTH AT 8FT. 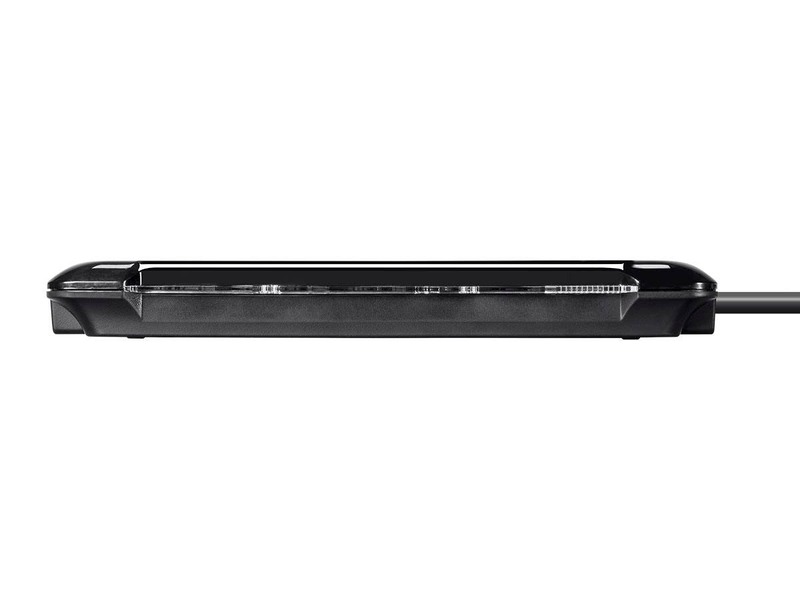 SLIM DESIGN A PLUS. THE SPACING IS GREAT TO PUT ALL SORT OF PLUGS NEEDED. WILL BE PURCHASING TO UPDATE OTHERS AROUND THE OFFICE. It's a beautiful piece of equipment with plenty of room for all your chargers. the surge protector works exactly as you would expect. It is of great quality and seems very durable. Would highly recommend . Very well made and excellent surge protection. Monoprice can't be beat for quality at a decent price. Shortly after getting this surge protector we actually had a pretty bad power surge, on and off 4 times in a row. Would have definitely blown some gear had we not been protected. We were running two high end gaming computers with six monitors, 55 in flat screen tv, modem, router, phones and a plethora of small electronic devices. Not a single bust. Everything powered down calmly and restarted without issue, whew could have been a miserable experience. Thanks monoprice, great product as always as promised. 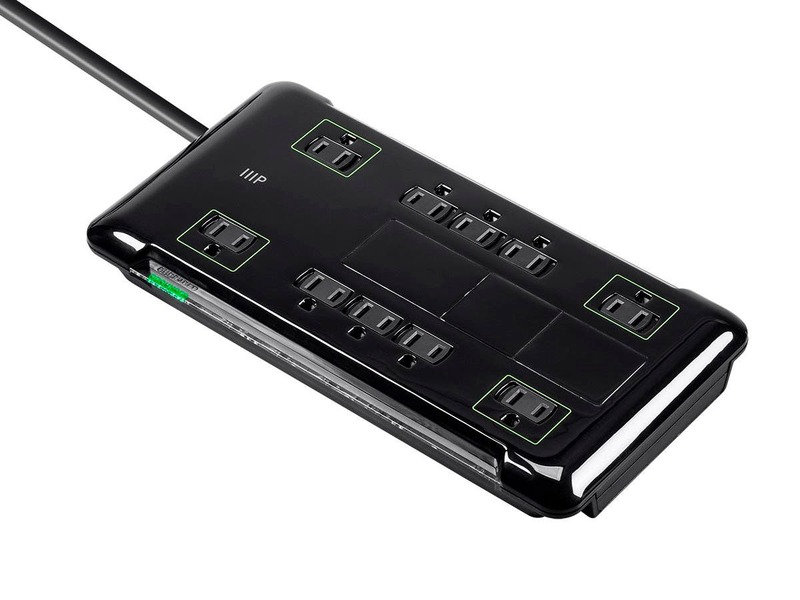 This surge protector works great, is light weight, and has LED lights when turned on.. It has room for 4 wall warts and 6 regular plugs. The dust covers are a nice feature. Overall, I'm please with my purchase!